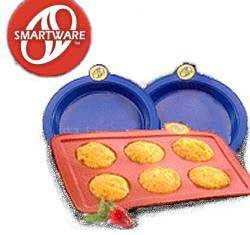 Smartware is the only hot-selling, flexible, non-stick bakeware made exclusively of Temperflex so everything comes out great. Food bakes evenly, cools quickly and pops out easily. Thats because Temperflex bends like rubber, stores like plastic, and lasts like steel. And Smartware is the only cookware of its kind with a massive multi-milion dollar broadcast campaign to back it up....and the only one of its quality available in a 3 piece set at this incredibly low price.